After an overwhelming response in 2017, Expogroup Worldwide announces another edition of MEDEXPO AFRICA, the leading healthcare trade fair in Africa. Taking place from 15 - 17 November, 2018 at the Millennium Hall, Addis Ababa, Ethiopia and 25 - 27 October, 2018 at the Mlimani Conference Centre (MCC), Dar es Salaam, Tanzania, the event brings together more than 5000 healthcare professionals with 400 of the world’s leading healthcare suppliers, manufacturers and service providers, all under one roof, to find the latest industry innovations, network and do business. MEDEXPO AFRICA 2018 is the perfect opportunity to discover first-hand, the best the healthcare industry has to offer, and to expand business associations with personal, one-on-one connections. Meet with global healthcare industry leaders and do business within the region at East Africa’s largest B2B networking platform. The African health care market is booming. With MEDEXPO fair that will take place in Ethiopia from 15 - 17 November, 2018 at The Millennium Hall. It is oriented to meet the increasing demand for medical manufacturing products, equipment, machinery, services, and solutions. The event profiles exhibitors from over 20 countries, innovative solutions from leading market players for the benefit of medical technology buyers from across the East African region. Africa is one of the most promising growth markets for medical technology anywhere in the world. The backlog demand is huge and exceeds investments. While public money is being invested predominantly in basic medical services, private hospitals and laboratories is the driving force behind modernizing the sector. They are investing in high-end technology to satisfy the rising demand. 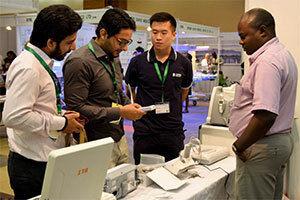 The product portfolio at the MEDEXPO will comprise of innovations from around the world that specifically target the African healthcare market. The exhibitors will present the entire spectrum of products from all relevant sectors: medical technology, hospital, health center and clinic equipment, rehabilitation, equipment for pharmacies and dispensaries, and furniture. Participating countries will include China, Malaysia, United Kingdom, Russia Turkey, France, Ethiopia and many others alongside numerous domestic exhibitors. According to medical professionals in the region: “It will be the most important and relevant trade exhibition for industry professionals in the medical field to source for products, meet new business contacts, build partnerships, and keep abreast of industry trends and developments.